Crescent Island is a large island in the southeast corner of Labrynna, shaped like the crescent moon. It is in both the past and the present. 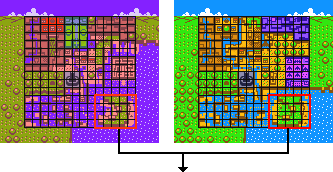 As shown in the images above, Cresent Island has changed very little over the years. These are several extra trees and the island is slightly bigger, but there is nothing dramatically different. One thing that is noticable, when playing the game, is that what you do in the past has some control of what the island looks like in the present. There are two things which you can change. The first is the vines. If you put a vine seed at the bottom of a wall, and then return to the present, you will notice that a vine has grown, which allows you to reach a new area. The second is the Scent Tree. Although shown in the images above, it is not always there. After winning the mini game on the island, where you have to throw meat to the different Tokay, you will win a Scent Seedling. After giving this to the Tokay on the North of the island, he will plant it and a tree will have grown when you return to the present. Supposedly, there was a Scent Tree on the island long ago, but the Tokay do not specify how long ago this was, or what happened to it. Also, on the west of the island is a small statue with two eyes. In the past one of the eyes are missing, so, until you get it later in the game it is not accessible. In the present, however, it is the entrance to Level 3, Moonlit Grotto. The only creatures on this island, who you can communicate with, are the Tokay. They are green Lizard-like creatures. This page was last modified on 13 January 2006, at 02:53.